The band was formed in November of 1996 with the line-up of singer Rick, guitarists Gesuz and Thorsten and drummer Stefan. Bassist Tom joined in 1997. 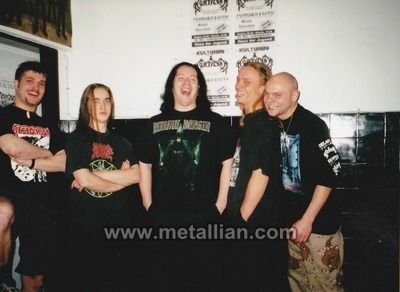 These German death metallers issued a live demo following its first live appearance, called Live Mutilation in 1997 followed by an EP named Victim Of Its Own Sort, which was issued through Maniacal Brutality of Latvia in 1998. The label had earlier included the band on the Grindom Comes... Chapter 2 compilation. Steudel had moved to vocals from bass in the midst of the recording of the studio EP to fill the void created by the sudden departure of Rick. The band had planned a split release with local boys Kadath as well. Stefan reported that the band had split up in 2001. While guitarist Gesuz retained the name, three former members had a new band called Tremor which would continue in the death metal vein. Here is the second German death metal unit of the issue - also from Kadath's area- and one which is impressive too. Following their live CD and appearance on several underground samplers, the five piece have gone into the studio and released six tracks of original material including a death metal instrumental. And the verdict? Cannibal Corpse aus Deutschland! The band is clearly inspired by the American heroes. The guitars, especially, have the same dynamics as a CC-composed tune. Having said that, the band is no miserable flop. For one thing, what they lack in originality, the band makes up for in the competency area. The guitarists and the carcinogenic vocalist know how to rip it up. The drummer is more than willing to blast his way through a legion of wimp rockers, and the suitably horrific lyrics leave one little doubt as to the band's intentions - as if the T-shirts on the band weren't enough. (Here is) more proof of the rise of death metal. - Ali "The Metallian"